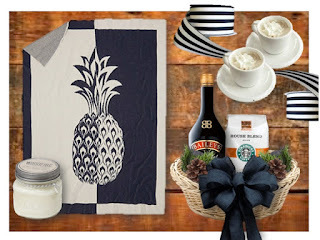 If you're like me, there are times when you're stumped when it comes to gift giving. 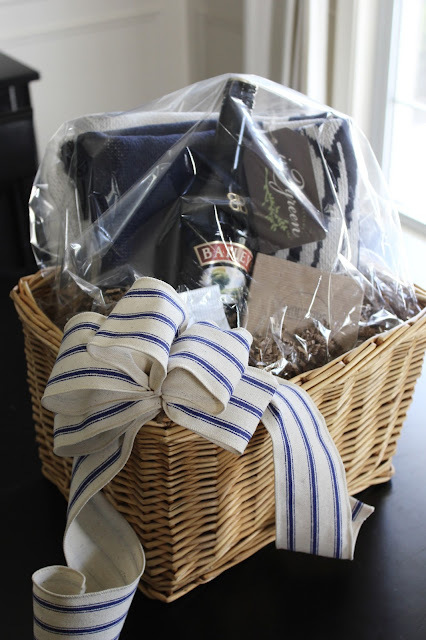 When I'm at a loss as to what to give to my special someone, I put together a gift basket. It gives me a chance to be creative and also helps me give something personalized that shows there was thought behind the gift. There are three things I consider before deciding what to put in it. The first is, what is the occasion (birthday, shower, holiday, get well, etc.)? The second is, what is the recipients passion or favorite hobby? The third is, what season is it? Considering these three things usually gives me enough inspiration to come up with a theme and to start creating a special gift. 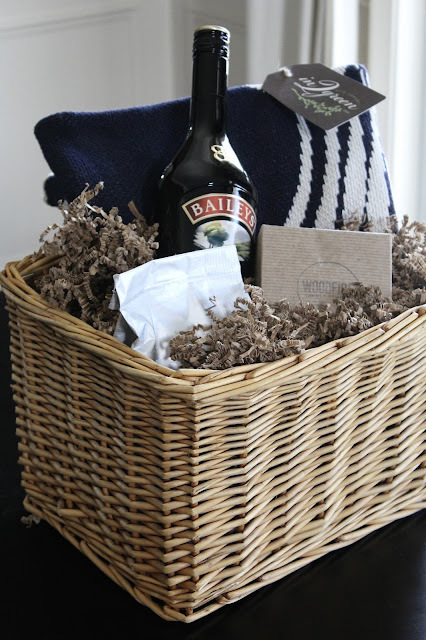 The items I put in this basket are the essentials for a warm, relaxing, indulgent, fall night at home. I started with this gorgeous, designer throw blanket from Uncommon Goods. 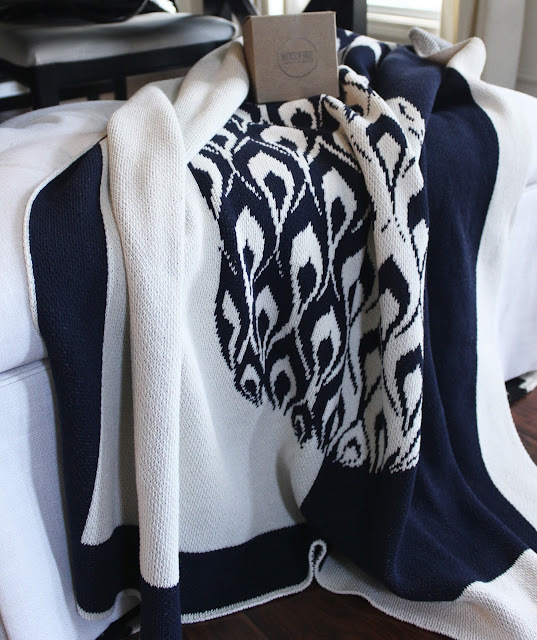 Aside from it's good looks and off-the-charts cuddle factor, there is an interesting story to this blanket, you can read more about it here. The next item, also from Uncommon Goods, is a crackling candle in a fall-inspired scent called "Sweater Weather". 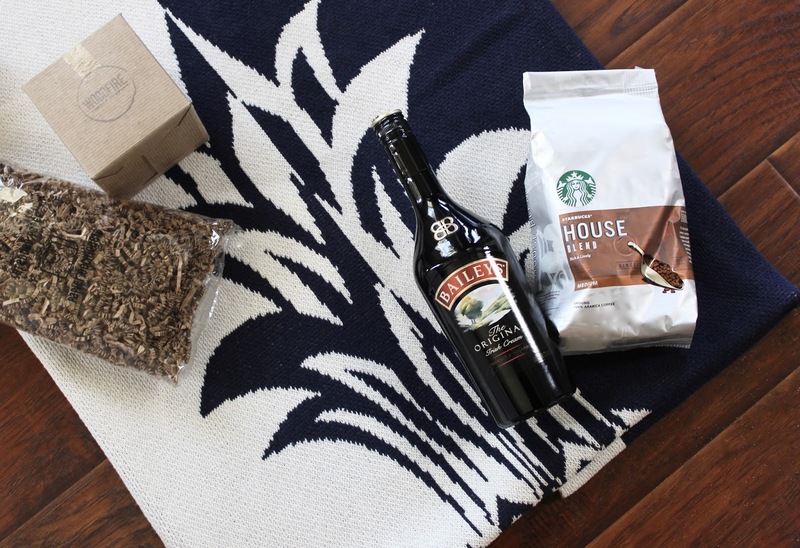 Now that I had the basics for a cozy fall night at home, I added the ingredients for the perfect fall night cap; Starbucks Coffee and Baileys. A small square storage basket was just the right size for the goodies I collected. It can also be used by my home decor enthusiast as pretty storage in her home after she opens her gift. 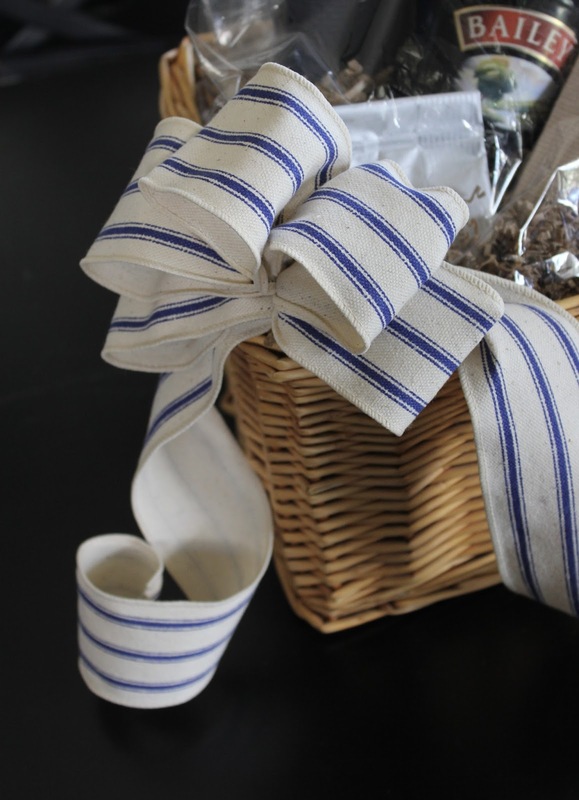 A simple, fabric, DIY wire rimmed bow in colors that complement the contents of the basket, paper stuffing from the gift wrap section and clear wrap finish off the gift. 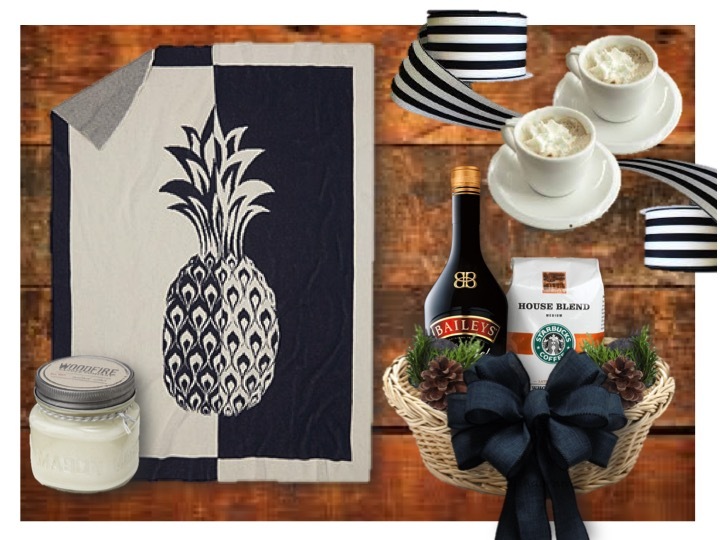 For more inspiration on collecting items for your gift basket, stop by Uncommon Goods. They pride themselves by stating that the exclusive Uncommon Collection of products meets their high standards for uncommon design, sustainability and doing good. Uncommon Goods has been awarded for outstanding customer service every year since 2007. In 2015 they achieved the BizRate Platinum Circle of Excellence Award. 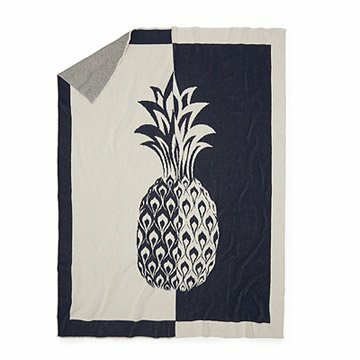 I have to admit that the Pineapple Throw featured in this post is one of my favorite things this fall. I'm so excited to deliver this gift basket this weekend. 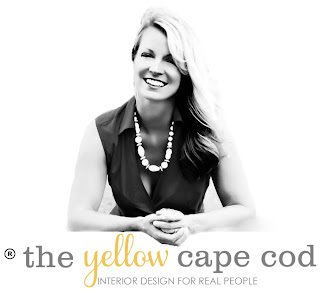 I'll be back in the design studio on Tuesday and also back on the blog to share some design projects that we've recently completed. I hope you have a wonderful Labor Day with family and friends! Online Design Services are now available. Please click here for details.Thanks for stopping by! *This post is sponsored by Uncommon Goods. Great idea!! I've always loved gift baskets and made up a few myself, usually with food. I like how you added some items that will be useful after the food/drink is gone.